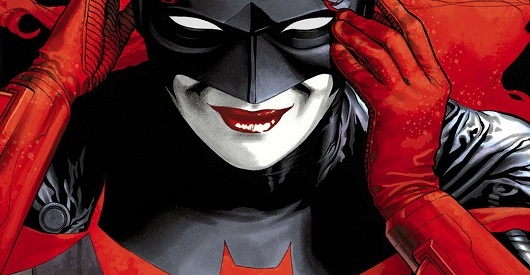 A Batwoman zero issue is a difficult thing to do so soon after her reinvention. It was in 2006 that the character Batwoman was reintroduced to us, as a completely different person to the heterosexual Kathy Kane who had been invented in the fifties as Batman’s beard and removed as non-essential ten years later. The new Kate Kane is a Jewish lesbian heiress from a military family and Greg Rucka did an incredible job in Batwoman: Elegy of giving off the impression of a strong, determined young woman who is also brutally human in her flaws. On her twelfth birthday she was kidnapped with her mother and identical twin sister, neither of which made it out, and was expelled from the military under the “Don’t Ask, Don’t Tell” policy as a result of being unwilling to lie to cover her homosexuality. After years of drinking and struggling, she was inspired by a fortuitous encounter with the Caped Crusader and decided to adopt the sign of the Bat herself. Since then she has battled with monsters, been stabbed in the heart, and found that the sister she thought had died was alive, and mad, before losing her again. When the issue begins, Kane is one the plane again, holding the villain to stop her falling to her death when she finds out that this is, in fact, her sister. The same words and same striking visual images from Elegy are framed by red voice-over boxes as Kane talks to her father in form of a message in the form of a good-bye message. She admits to recording them every time she went out as Batwoman to thank her father and tell him that she loved him. Every time, until she lost her sister Beth again; “The night I started hating you.” This is a really emotional first page that brings you right into the story – we know that Kate’s relationship with her father was the only stable one she had in her life after her twelfth birthday, and the idea that she would hate him is tragic. The flashbacks to Kate’s childhood are rendered in a simplified style, reminiscent of Bunty comics and showing the intensely close relationship she had with Beth, who was always there to control her when she couldn’t control herself. She remembers with love the way her father had been patient and kind with her after the funeral and became strong for her when she was so angry and afraid. The repetition of the six-panelled pages veers between brief glimpses of her life (sleeping with various women, getting tattooed, meeting Renee Montoya) and slighter longer pieces of Kate confessing her love of being drunk and helpless – because he would be there to take care of her. On the next page, the old-fashioned block artwork collides with the textured inking that we saw in Batwoman: Elegy as the dark Batman stands over the simpler Kate as he stops her from beating a mugger to death. The full-page spread is beautiful, and if you are a Batman fan you are bound to appreciate the inspiration and awesomeness of the image of the powerful man – but Kate knows instantly that anyone could be under the mask, even herself. So she begins her crusade and soon her father finds out and sends her on a two year training course to make sure that if she wants to do this, she knows what she is prepared for. In Elegy it was mentioned that she had been away training for years, but never explained where it was she had gone; we find out now, and it is brutal to watch her push herself to terrifying limits, both physically and psychologically. She was offered a chance to put her energies somewhere better – to helping sick children in Africa – but turns it down. Her final mission, back again in a the simplified art style, involved rescuing a family from Russian extremists, dealing directly with her own past and fears. When she breaks into the building to find their throats cut, the number of panels increases so we see flashes through her rage – blood dripping from the knife, her face full of rage, the smiling mask on the man who committed the atrocity, and she goes mad attacking him, only just stopping short of killing him. When she asks why, he removes the mask and reveals himself to be her father ensuring that she would not kill even in the most emotionally blinding situations. J.H. Williams beautiful artwork really kicks in now, with the fantastically iconic image of Batwoman smirking beneath her mask as the monsters of her new life assemble below. She explains that rather than seeing it as leaving Gotham as Kate Kane and returning as Batwoman, she left as his “lost little girl” and came back knowing who she was. She was strong and confident and self-assured, until she found out that her sister hadn’t died. She claims that the moment she became Batwoman was on the plane, when she lost Beth again and realised that her father had deceived her, kept this secret and that she had no one to trust but herself. She signs off by telling her dad she loves him; she doesn’t forgive him, but realises that it is necessary for her to be alone. Becoming Batwoman required picking herself up from rock bottom. The central story of this is Kate’s relationship with her father, but that relationship is so wrapped up in her traumatic experience as a child and how she learnt to cope afterwards that it’s a vital part of her transformation. The style of writing, as a confession letter to someone she knows will never hear it, reminded me of Batman stories in which he talks to his parents’ graves. In Elegy, Rucka did an amazing job of giving a voice to Batwoman, but in this zero issue Haden makes us really understand Kate Kane in a touching and exhilerating way. Williams’ artwork is always incredibly beautiful and detailed and the lay-out of the pages is easy to read without being boring in the slightest. I’m not sure if it would still have the same amount of emotional pull if I hadn’t already been in love with Kate Kane and Batwoman, but this comic should be a good starting point for a crash-course in the new heroine’s troubled backstory.